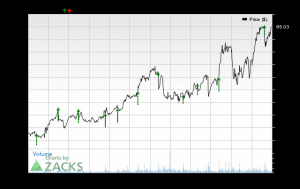 Alarm.com Holdings (ALRM) closed the most recent trading day at $63.89, moving -1.45% from the previous trading session. This move lagged the S&P 500's daily gain of 0.07%. Meanwhile, the Dow lost 0.21%, and the Nasdaq, a tech-heavy index, added 0.13%. Prior to today's trading, shares of the security service company had gained 19.24% over the past month. This has outpaced the Industrial Products sector's gain of 6.53% and the S&P 500's gain of 5.36% in that time. Investors will be hoping for strength from ALRM as it approaches its next earnings release, which is expected to be February 28, 2019. On that day, ALRM is projected to report earnings of $0.24 per share, which would represent a year-over-year decline of 7.69%. Meanwhile, our latest consensus estimate is calling for revenue of $99.63 million, up 12.21% from the prior-year quarter. Investors should also note any recent changes to analyst estimates for ALRM. These recent revisions tend to reflect the evolving nature of short-term business trends. As such, positive estimate revisions reflect analyst optimism about the company's business and profitability. The Zacks Rank system, which ranges from #1 (Strong Buy) to #5 (Strong Sell), has an impressive outside-audited track record of outperformance, with #1 stocks generating an average annual return of +25% since 1988. Within the past 30 days, our consensus EPS projection has moved 0.22% higher. ALRM is currently a Zacks Rank #1 (Strong Buy). Valuation is also important, so investors should note that ALRM has a Forward P/E ratio of 46.94 right now. Its industry sports an average Forward P/E of 18.54, so we one might conclude that ALRM is trading at a premium comparatively. It is also worth noting that ALRM currently has a PEG ratio of 2.75. This metric is used similarly to the famous P/E ratio, but the PEG ratio also takes into account the stock's expected earnings growth rate. ALRM's industry had an average PEG ratio of 1.7 as of yesterday's close. The Security and Safety Services industry is part of the Industrial Products sector. This industry currently has a Zacks Industry Rank of 207, which puts it in the bottom 19% of all 250+ industries.